Even when it has been organically grown, the corn that we eat is not natural, and it is quite different from wild corn (teosinte). Our crops have been genetically modified via thousands of years of careful breeding, and the fruits, vegetables, and animals that we eat today contain novel genetic codes that are not found in nature. Image via rrunrrun.blogspot.com. First, we have to talk about how we grew food prior to GMOs. Excluding seafood, almost none of the food that we eat is truly natural, even if it has been organically grown. The type of corn that we eat, for example, is not found in nature. 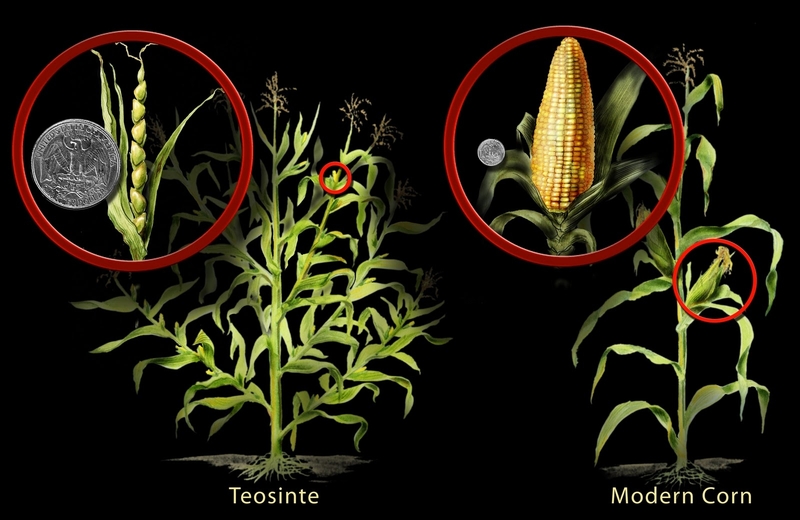 Natural corn (teosinte), is tiny and pathetic. So where did our large, juicy ears of corn come from? Well, thousands of years ago someone discovered that you could eat the tiny, pathetic wild corn. So they began to grow it, but they were smart, and each year they planted the new crop using only the best plants from the previous year. In other words, each year they selected the biggest and best ones, and they planted those. As a result of this process (known as artificial selection), each year the ears of corn became a tiny bit bigger than they were the previous year. After several thousand years of this process, we finally have the corn that we enjoy today. Obviously, no one objects to artificial selection. No one says that it is “unnatural” even though it is by very definition unnatural (i.e., “artificial” and “natural” are antonyms), but, the products of artificial selection are, in fact, genetically modified organisms. We don’t label them as GMOs because they weren’t made in a lab, but they are organisms whose genetics have been modified. They have genetic codes that simply are not found in nature. So, if your problem with GMOs is that you don’t like the idea of humans creating and consuming organisms that don’t exist in nature, then you had better live by foraging from the forest, because virtually all of our crops and livestock have been genetically modified by careful breeding. Further, our genetic manipulations through careful breeding are not limited to making crops larger, we can also breed different populations to get two beneficial traits in a single crop. For example, suppose one field of corn is very drought resistant, but it doesn’t produce large ears. Meanwhile, a different field produces large ears, but doesn’t do well during droughts. We can cross breed those two populations, and the resulting generation will have genes from both groups of corn, resulting in crops that are large and drought resistant. Notice, by doing this we have made a novel combination of genes that is not found in nature. We have recombined the DNA of these plants to produce new gene sequences. The only difference between this and a GMO is that we used crossbreeding to combine the genes whereas GMOs rearrange the DNA in a lab. Either way, we are manipulating organisms’ genetic codes. Even more spectacularly, we can hybridize two different species of plant! This doesn’t simply result in a plant that is larger than the ones found in nature, rather, it results in an entire fruit that is not found in nature. Think about this for a second, one of the biggest objections to GMOs is that people don’t like the concept of splicing the genes from two different species together, but that is exactly what fruits like plumcots are. Biologists took the genes of two different species and merged them. We don’t consider plumcots to be GMOs because their genes were spliced by breeding not by laboratory manipulation, but this distinction is completely artificial. It doesn’t matter whether this new organism was formed by splicing genes in a lab or by careful breeding, either way, it results in a novel genetic code that does not exist in nature. With this realization in place, the majority of the arguments against GMOs fall apart because if they worked, they would also apply to our non-GMO foods. For example, you may have heard about concerns that GMOs will hybridize with wild plants, well guess what, our non-GMO crops can do that too, and they are just as unnatural as GMOs (i.e., they also contain a genetic code that is not found in nature). Similarly, you may have heard that bacteria in your gut will take up some novel strand of DNA and make a new and dangerous protein, but, since our hybrids and other non-GMO crops also contain novel strands of DNA, bacteria can, in concept, do that with regular crops as well (note: there are lots of other problems with that bacteria argument, but I won’t go into their details here). My point here is quite simple: GMOs are not some novel freak of science. They are simply a natural extension of what farmers have been doing for thousands of years. 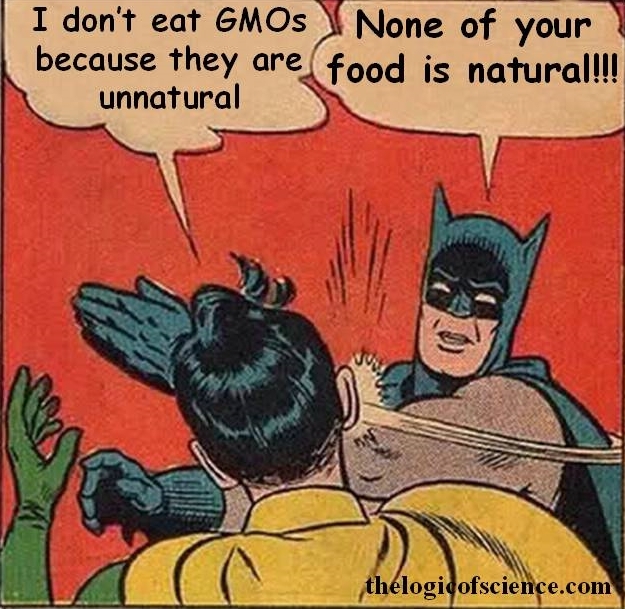 Virtually all of our crops are unnatural, even if they are grown organically. Almost every bite of food that enters our mouths contains novel strands of DNA that are not found anywhere in nature. So if this concept of eating “unnatural” foods freaks you out, then I am afraid that you are in serious trouble, because nearly all of our crops and livestock have been genetically modified by careful breeding. This entry was posted in GMO and tagged appeal to nature fallacies, Bad arguments, GMOs. Bookmark the permalink. Actually, there is one big difference between so called GMOs and Artificial Selection: Artificial Selection can (and does ) bring along traits other than the one selected for, whereas lab techniques can be very specific in the trait selected. A good example is dog breeding. Aggressive selective breeding in the purebred circles have not only produce hounds with bigger ears and bulldogs with shorter snouts, it has also created Labs with hip displasia, and chihuahuas with fragile bones. There are probably botanical examples, I just do not know any offhand. Perhaps a topic for the future? That’s a really good point. People are often concerned about unintended effects from GMOs, but GMOs are far more precise than artificial selection. The bigger problem with dog breeding, in many of these cases, is that as you inter-breed the “best” of a breed, you end up with a lot of in-breeding, and you continually shrink the gene pool… which, as with human in-breeding, leads to genetic damage, “bad” mutations, and health issues. Presumably the same thing is possible with crossbreeding crops, but certain types of animal breeding, particularly with dogs, tend to concentrate on specific desired traits with no concern for the problems – as long as the animal can be sold for those traits, nothing else matters. Fortunately, when farmers cross-breed crops, they also have to deal with the results, and the continued existence of their crops depends on maintaining a solid gene pool, so there’s more incentive to cross-breed carefully. Great article and reminder to those who do not understand agriculture and fear the “unknown” or sadly advocate false information. I don’t necessarily think of GMOs when I eat and when I plant my garden. I use Heirloom plants that are great because you can easily save the seeds and plant similar heirloom varieties that have not been hybridized in the sense of splicing genetic material. It’s much better than hybrid plants (F1) whose saved seeds will not create new plants (F2) that have the same characteristics as the F1 plant. Thus, seed companies can sell annually and make money. Large-scale, it may not be worthwhile to save seeds, but ANY home gardener knows it’s not that difficult to do so. Although conventional and organic farming are ALWAYS labor and energy intensive, again, I am less concerned about GMOs and more about synthetic herbicide and pesticide use and the depletion of nutrients in the soils. So a GMO plant can be spliced with fungicidal and insecticidal properties, but it will still need copious amounts of herbicides, and current agricultural practices rely heavily on synthetic fertilizers which don’t maintain soil quality. “Organic” certification standards certainly follows more environmentally sustainable guidelines, and of course uses botanical (manipulated) herbicides and pesticides along with compost, but at least in practice, it makes much more sense since the focus is on soil structure and nutrient density. Again, labor intensive, but let’s be real, there’s nothing easy about agriculture. It takes time, money, resources, and patience. But there are better ways to grow food, and it certainly includes sustainable genetic manipulation. I am not anti-GMO but I don’t like logical falacies and this blog post commits one. This is a straw-man argument because generally anti-GMO people (the more intellegent ones, not the dumb ones) do not see hybridization and such as unnatural. What they object to is actual genetic modification. I am not saying I agree with those people, but you should at least address what they are actually saying rather than two stepping and trying to fix a problem that doesn’t actually exist. You’re completely missing the point of this. I know that most people don’t consider hybridization to be unnatural. My point is that hybridization IS unnatural because it produces genetic codes that are not found in nature. The entire point of this post is that hybridization is a type of genetic manipulation, even though anti-GMO activists typically don’t think about it that way. In other words, I am pointing out a logical inconsistency in their reasoning. As such, it is in no way shape or form a straw man fallacy (your comment is one, however). He is not setting up a straw man. Hybridization is “actual genetic modification.” That’s the point. Saying hybridization is OK but genetic modification in a lab is not shows logical inconsistency. Anything made by nature is generally as good as it gets, once we start with artificial genetic modifications and the such especially with poison chemicals you’re not going to produce a better or safe product. Gmo’s testing on lab rats are showing horrible results after 3 months. Further, we can do things with GMOs like make rice that contains essentially vitamins that are not naturally found in rice. GMOs are quite literally saving lives in countries where people don’t have sufficient access to food. If you’re going to make a claim like, “lab rats are showing horrible results after 3 months” you need to provide sources, because nearly every study on GMOs has found them to be safe. I am assuming that you are referring to the methodologically flawed (and now retracted) 2012 study in the journal Food and Chemical Toxicology, since that is nearly always the paper that I see anti-GMO activists citing. Monsanto ended animal studies at 3 months, the rats grew Hugh tumors after that time period, it’s well documented in French and other peer reviewed literature . Again, please show me the paper. The only paper I have been able to find showing that rats grew tumors after eating GMOs is the one mentioned before which has been thoroughly discredited because its methodologies were terrible. You can keep saying that it is well documented all you want, but that’s meaningless until you can actually back it up by showing me the papers. I agree with the basic premise of the author, but corn (maize) is not a good example. That is not what happened. The actual maize was a mutation of the tassel, the male part. Corn is probably the single most complex and genetically unusual of the crops.There are articles on this if one is interested. Better would be wheat, barley almost any large sweet fruit. Apples, peaches (almonds are the same species selected for the fruit and the nut) and so many others. As a hybridizer of fruits shrubs and flowers I welcome considered Genetic modification. There is no other way forward. Thanks for pointing this out. You are certainly correct that mutations have been involved in the process of domesticating corn, but is it not also true that artificial selection for the best plants has also played a role? In other words, mutations have allowed us to make large jumps, but there has still been a lot of selection for the plants that were producing the best results, ultimately resulting in genetic varieties that are not found in nature. -Your argument hinges almost entirely on what the word “modify” means. You cast a wide net which encompasses GMO, hybrids, cultivation, and basically any human agency toward food. Actually, any agency human or non. If my dog decided that lemons of a certain color look like tennis balls and started burying them in my back yard there would eventually be a grove of lemon trees that otherwise would not exist and would be distinct from other lemon groves. That scenario, however silly, seems to fall under your operational definition of “modify”. -I think my dog planting lemon trees and transgenic insertion of foreign genetic material is fundamentally different. False equivalence. -Transgenic insertion is not an exact science. Neither is selective breeding. The difference is selective breeding doesn’t sometimes give you plants that grow inside out. If the process was fully understood and mastered there is no way we would not be knee deep in GATTACA babies. A degree of uncertainty and “whoops” is allowed because they’re just plants (that we eat), right? –GMO crops have yet to increase yields or drought tolerance or nutrition [Failure to Yield]. They have, however, helped sell an awful lot of herbicides and pesticides which end up in our food supply and waterways (which, incidentally, is a awful lot /ba-dum-ching). –The purveyors of GMOs are not very nice. That may seem like a trite thing to say, but when you are dealing with people whose stated goal is controlling the world’s food supply these things matter. People in the “selling seeds” business should not be hiring thugs or lawyer bombing farmers or lobbying for legislation that makes basic journalism illegal. –Patenting life is a terrifying two word combination. Just, ewwww. Re-reading my post (something you should do before you hit submit!) it occurs to me that someone might get hung up my dog being color blind, even though he can (probably?) differentiate grayscales of lemons. Just pretend I said shape. Damn dog stealing all my roundish lemons. Regarding the first section of your post, you are misusing my definition of modify. I am only using it to refer to any genetic modification. As such, your dog example is completely fallacious because no genes have been modified. My point (which you in no way addressed) is the there is no a priori reason to think that modifying genes in a laboratory is more dangerous than modifying them via careful breeding. In other words, the mechanism for causing the change is different, but the change itself is the same. So there is no reason to think that the change is dangerous in GMOs but safe in conventional crops. I’m not exactly sure what you mean by “plants that grow inside out,” but I suspect that you are committing an appeal to emotion fallacy (i.e., you have to demonstrate that this is a bad thing). Also, selective breeding does actually result in a number of truly bizarre and unusual traits. “GMO crops have yet to increase yields or drought tolerance or nutrition [Failure to Yield]. They have, however, helped sell an awful lot of herbicides and pesticides which end up in our food supply and waterways (which, incidentally, is a awful lot /ba-dum-ching).” At this point, it is obvious that you haven’t actually done your homework, because these claims are demonstrably false. GMO crops have been demonstrated to improve yields in many situations, and some of them (like golden rice) are specifically designed to increase nutrition (and they do it quite well). Also, GMOs use less pesticides, not more. You need to get on Google Scholar and actually look at the facts of GMOs before you decide that they are bad. Regarding your final comment, first, its an ad hominem fallacy. Second, can you provide a source that GMO scientists/companies’ “stated goal is controlling the world’s food supply”? Are you aware that the Gates foundation is one of the biggest investors in GMOs, and that some GMOs (like golden rice) have been designed with the sole intention of helping poor countries that have bad nutrition? Please explain to me how the Gates foundation has the goal of controlling the world’s food supply. I think it is a worthwhile point to consider that the ‘safety’ of GM foods extends beyond purely the science behind them being safe to eat to how the companies using them act (as well as other things such as possible effects on the surrounding ecosystem…which I know nothing about but I imagine could be an issue). These are clearly separate issues but I think they are often confused. Immoral actions by companies shouldn’t affect the science of GM foods and the science of GM foods doesn’t change the morality of acts by GM companies. To generalise this point, I’m enjoying reading your posts but I think they could benefit from clearly establishing how the posts fits into the larger debate. That’s not to say you have to go and deal with all the other issues (because this site does a nice job of focusing on responding to illogical arguments against science) but it’s worth noting that they exist. You make a fair point, but as you noted, I am trying to focus on one issue at a time. I would like to clarify though that I am not arguing that all GMO companies are good, but simply that they aren’t evil and aren’t trying to depopulate the planet. Not being evil is not necessarily the same thing as being good.